In this post we list out ten of the best men’s hiking boots of 2019. This should give you plenty of options if you’re in the market for a new pair of boots for the trail. We keep the descriptions brief enough to try and give a quick but concise overview, along with the main pros, cons and best uses. These boots are listed in our order of preference, with some singled out as the number one option in a particular area or category e.g. 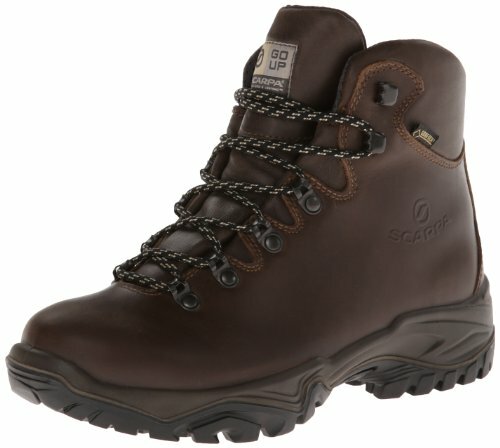 best value hiking boots. 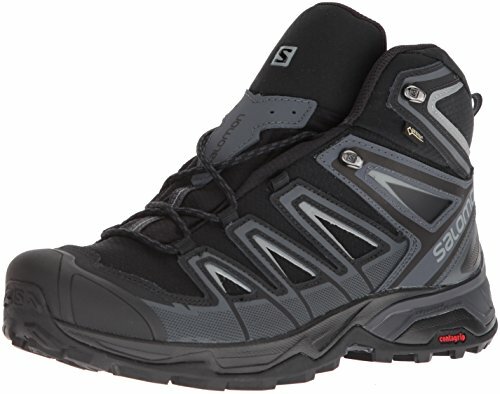 The Salomon Quest 4D 3 GTX Hiking Boots are a top seller Amazon and with many retailers. Whether you want to head for a week out backpacking or a day hike into the hills, these boots will do the job comfortably. The Quest 4D 3 GTX hiking boots are another tough pair of hiking boots. They're probably more suited to tough hiking and backpacking than casual day hiking, they have a lot to offer, but they will work just fine for a day hike out on the trail. Waterproof and very breathable, their leather and Gore-tex construction means that you actually get a very tough boot without it being overly heavy. This is of course by design but in relative terms of day hiking, they are still a heavier option. Ideal for backpacking and hard hiking, the Quest 4D GTX 3 hiking boots for men are a technical option that should see you well covered for most, if not all, of your hiking needs most of the year round. They come in around the top end of the price range for a pair of boots in this class, so not a cheap pair of boots but they have a lot of rave reviews from happy avid hikers. 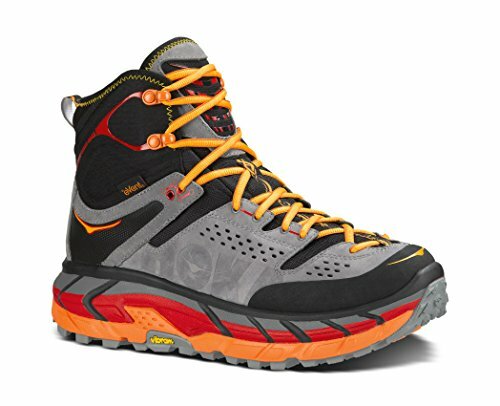 I know several happy users personally and they all highly recommend the Salomon Quest 4D 3 boots. Definitely worth a closer look for sure! It’s a hard one to call as even with the best user experience in the world, one man’s meat can always be another man’s poison… ergo, the boots that you think are the best thing since sliced bread, might well be anathema to the next man. Everyone has different and unique requirements as well as a preference for a different style or look. Some love that traditional Alpine leather look while others want a more technical and modern statement from their hiking boots. Of course, as always, the market caters for all tastes, shapes and sizes and you can, generally, learn a lot from people’s functional user experience with hiking boots. The most important bottom line piece of advice to know before you buy is simply, know what you need your hiking boots for. Suffice it to say, everything listed on this page, are all top quality hiking boots with lots of good user experience with them. However some of them are better suited to particular hiking activities than others. For example, a perfect day hiking boot may not cut the mustard on a backpacking trip. It can also be a common mistake for someone to get too much boot for their needs so keep that in mind. If you’re totally new to buying hiking boots and would like some more information on how to choose, check out the hiking boot buying guide to give you an idea of what you should be thinking about before picking a pair of boots. Note, that prices are not listed in definitive detail here. Any prices referenced are guide retail prices and are meant only to serve as a guide as prices chop and change all the time. To see live prices, click on the 'View More' button and you will be taken to the live price for each pair of boots on Amazon. OK, so with that all done and dusted, let’s roll on and look at some more of the top men’s hiking boots for 2019! The Keen Targhee II Hiking Boots are another top seller on Amazon and have been around for a fair few years at this stage. In that time they have made many happy customers with their reliable and comfortable performance. 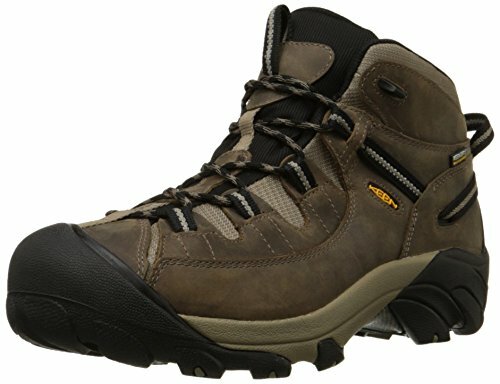 The KEEN Targhee II Mid Hiking Boots are a top seller on Amazon. They’re a popular boot in the mid-range category. Probably best suited to a lighter day hiker who stays on trails, they still have a lot of very good user experience reported across the board on their performance. The Targhee II are waterproof and breathable so they’re perfect most of the year round, definitely 3 season, maybe 4 depending where you go hiking. The level of waterproofness is not on the same level as say the Asolo Power Matic boots, we look at those below, but they will keep you dry under reasonable tests e.g. puddles, moisture on grass, lighter rain showers, etc. Their look is a kind of hybrid, an autumnal feel but definitely taints of the technical design there too. It works though and at $105.00 to $159.00, you could do a lot worse for a light hiker. 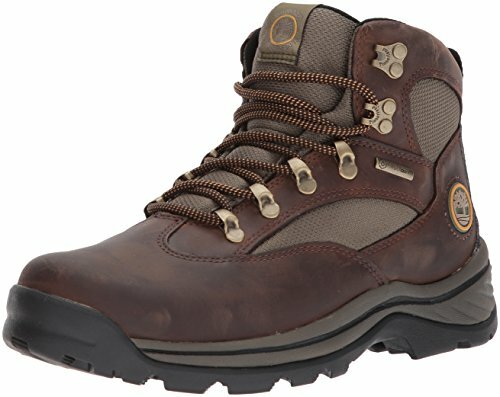 The Timberland Chocorua hiking boots are stylish pair of leather hiking boots that offer decent comfort and performance, without breaking the bank. Last time we checked, the Chocorua hiking boots were actually THE top seller on Amazon, which is quite a claim to fame. That makes sense given the nature of these boots as excellent hiking boots for general outdoor use. The Chocorua boots are another good option for the light to medium hiker. They’ll perform great on trails with a bit of off trail but I wouldn’t push them too hard beyond that. If you’re a newbie to hiking or recently started and considering getting a better pair of boots to see you through plenty of day hiking without breaking the bank, these could be the ticket. They utilize the leather upper and Gore-tex lining combination so they will offer a reasonable level of protection from the rain and wet. Retailing in and around $139.99, they’re an accessible option for day hiking, general outdoor use (fishing, camping etc.) and normal day-to-day use. A personal favorite from our editor, he's been getting a lot of enjoyment out his pair of Meindl Vakuum GTX boots. Meindl are better known in Europe than in the US, but they make some very sweet hiking boots! These are the editors current favorite boots of the moment. Meindl are definitely seem to be more well-known and common in Europe than in the US, but they have a lot of quality hiking boots in their product offerings. The Meindl Vakuum hiking boots are a sturdy, tough and very durable pair of hiking boots. They feature Vibram outsoles which perform excellently on all types of terrain. I’ve been using them now for about a year and they have held up very well in everything from snow, to bog and everything in between. Although technically they are a three season boot, I think they are a really a four season boot (with the exception of when it’s very hot) and they perform well in light to medium snow when it’s cold and wet underfoot. They definitely sit at the higher end of the price scale, but you get a lot of bang for your buck! The boots are also resolable and so you can expect to get a very long life from them. The Lowa Renegade are an excellent choice as a functional year round pair of hiking boots. More 3 season, than 4 season, they still offer exceptional functionality and comfort. The Lowa Renegade Mid GTX are a global star in the world of hiking boots. They have a lot of very happy users across the board over a long chunk of time so they’re a tried and trusted model that scores consistently well in terms of performance, comfort and functionality. The construction is waterproof breathable Gore-tex. Gore-tex is of course an industry standard when it comes to waterproof and breathable hiking boots and the construction of the Renegade boots performs well. The soles are Vibram so again, a popular industry standard that performs very well. Perfect for the light to medium hiker most of the year round, the Lowa Renegade Mid GTX Hiking Boots retail at the higher end of the price range for hiking boots, but they're an excellent pair of all round hiking boots. 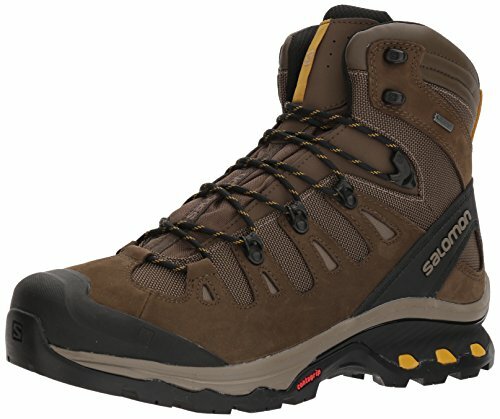 Another great pair of hiking boots from Salomon on out top hiking boots for men list, the Salomon X Ultra mid hiking boots, are a lightweight and functional pair of hiking boots. Traction and grip on certain kinds of rock, especially when the rock is wet, is not the best. The X Ultra Mid 3 GTX hiking boots for men are another excellent pair of boots and the 2nd on our top ten list from Salomon. As with the Quest 4D 3 GTX, they have a very technical look about them, being both modern and stylish. The sole of the boots are made from rubber and feature a Contragrip traction outsole which performs well on most types of terrain, although some users commented that they weren’t the best they could be while hiking over smooth rock. They’re a light pair of boots in comparison to some of their peers, especially their cousin, the Quest 4D 3 GTX mid hiking boots. They provide a very comfortable fit with good cushioning and they, in most cases, should not require a significant break-in period. They X Ultra Mid GTX boots are reasonably water resistant via their Gore-tex lining and should do well for trail hiking most of the year round, certainly for 3 seasons of the year. There were some comments from users about the breathability not being as good as it could be in hotter conditions, but aside from that and the traction comment referenced above, they have a generally positive run of feedback across the board. They are in the low to mid, section in terms of price, coming in, at around $100 to $150. They’re a good entry level pair of hiking boots, that are versatile enough to handle various kinds of hiking and shorter backpacking trips. A pair of boots with a very 'pleasing to the eye' design, the Vasque Breeze are another excellent choice for trail and day hiking. In a similar vein as the timberland Chochoruas and the Keen Targhee boots listed above, the Vasque Breeze 2.0 GTX hiking Boots for Men are another light hiker option. They’re a lightweight mid boot and are designed for light hiking over relatively easy terrain. They are waterproof but I wouldn’t expect too much from them in that regard, some light showers you’ll be fine, walking across a river at foot level, they won’t cut it. However, for on-trail light hiking at a reasonable price, you’re in the ballpark with the Vasque Breeze 2.0 GTX Hiking Boots. 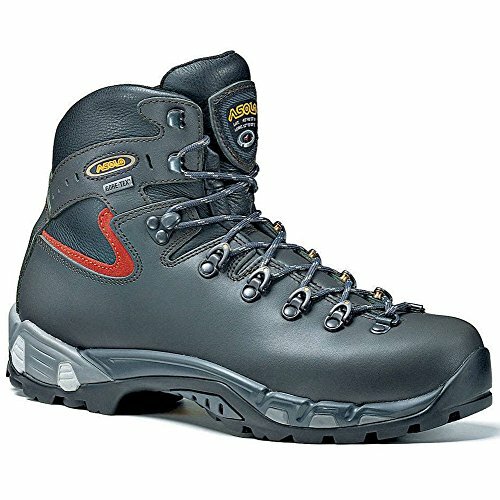 Retailing at about $169.00, you’ll get a comfortable light hiking boot that will do great for light weekend day hiking. Constructed using design principles of both hiking boots and running shoes, The Hoka One One Tor Ultra hiking boots, are a lightweight and very comfortable pair of hiking boots. The Hoka One One Tor Ultra HI hiking boots are an interesting pair of boots, as they are designed with the combination of running show cushioning with supporting trekking uppers. This is an interesting combination which of course offers the wearer a lot of comfort. Keeping the running ethic in mind, these boots are particularly lightweight to enable smooth movement at any pace, across most types of terrain. The thick outsoles also deliver fantastic shock absorption too, which helps keep your feet from getting tired and stressed on tough ground​​​​​​. They are water resistant but it seems the capability in this area is limited, as many users commented that it could perform better in this area. Another area that came up a few times for critique was in terms of traction over certain types of terrain, especially when wet. In terms of price, they retail in and around $150 to $200, so definitely at the high end of the medium scale in terms of price, touching into the higher price scale in fact. While maybe not the best all round performer, if you need lots of comfort and cushioning for day hiking or light trail hiking in fair conditions, they could do a very decent job for you. What can you say about the Asolo Power Matic 200 GV boots!? A whole lot as it turns out! A power packed pair of backpacking boots that can take on the toughest hiking you can throw at them. Further shock absorption is obtained through the four strategically placed low-density cylinders that are linked from the outsole to the midsole. Even though they are leather, they have a very technical no-nonsense look and style to them. These are ideal for hard backpacking trips or hiking over tough and rough terrain like snow, mud and off trail legs. They’re waterproof and, again, as we’re looking at a leather construction, a significant break in period will be needed. These boots will be heavier than a standard pair of hiking boots but that’s why they’ll last the course. 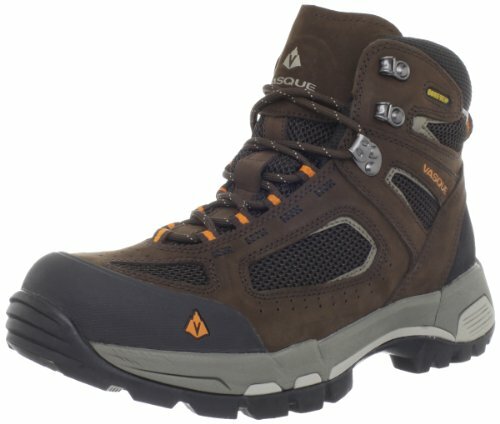 You’re looking at in and around $300.00, in terms of retail prices, for the Asolo Power Matic 200 GV boots. That seems a lot, but these boots will last for a very long time so the investment could be worth it. A classic look and style all over the Scarpa Terra GTX hiking boots, they're ideal for trail hiking and low to mid level difficulty hiking. Their Vibram soles provide good traction and the nubuck leather and Gore-tex lining combination ensure a good level of breathability and waterproofness. I like the look and style of these boots, they have a traditional yet modern look that will look as well with a pair of jeans as they do on the trail. They’re not a very heavy pair of boots, but not the lightest either. They’re designed more for trails and lower level hiking i.e. in valleys, forests, etc. Overall though, a very nice pair of functional hiking boots which really look the part. The Scarpa Terra GTX boots come in at around $188.95 retail. They’re a good option for the medium day hiker that likes to push things a bit further only every once in a while. I hope you enjoyed this quick look at ten of the best men's hiking boots of 2019 available on the market today. As you can see, there are a lot of options to choose from. If you're in the market for a new pair of hiking boots, you could do a lot worse than choosing one of these options. Always remember to know your requirements clearly before buying a new pair of boots. It is very possible to get too much boot or too little boot for your needs and you can be easily disappointed. I would suggest that it's usually better to have more boot as opposed to less i.e. tougher boots than you need rather than boots that don't deliver enough. Best Hiking Shoes For Women In 2019 Best Hiking Shoes For Men In 2019 Best Backpacking Packs For Men In 2019 Best Hiking Pants For Men In 2019 10 Of The Best Women’s Hiking Boots Of 2019!